Science Fair Requirements: Available here. | Graduation Prep Outline: Available here. Homework: Available here. | Journal Entry: Available here. | Write Up: Available here. 2015 – 2016 STEP Application: Available here. Science Fair Requirements: Available here. | Graduation Invite: Available here. Tour Homework: Available here. | Journal Entry: Available here. | Write Up: Available here. Tour Homework: Available here. | Journal Entry: Available here. | Handout: Available here. | Tour Summary: Available here. Tour Homework:Available here.| Handout: Available here. | Tour Summary: Available here. Tour Homework: Available here. | Journal Entry: Available here. | Tour Summary: Available here. Tour Homework: Available here. | Journal Entry: Available here. | Handout Available here. | Tour Summary: Available here. Tour Time: All tours depart from the Cleveland Division of Water at 8:00 AM, and return to the Cleveland Division of Water at 2:00 PM. 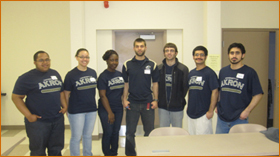 On March 16, 2013 the S.T.E.P Program traveled to the University of Akron. The tour allowed students to tour part of the campus; particularly the College of Engineering and the Student Center but they also received hands-on experience with several workshop demonstrations. Students learned about determining Acids and Bases through testing various liquids at the same time learning about Bio-Medical and Chemical Engineering. Students enjoyed the team building activity building the Fuzzy Stick Towers. 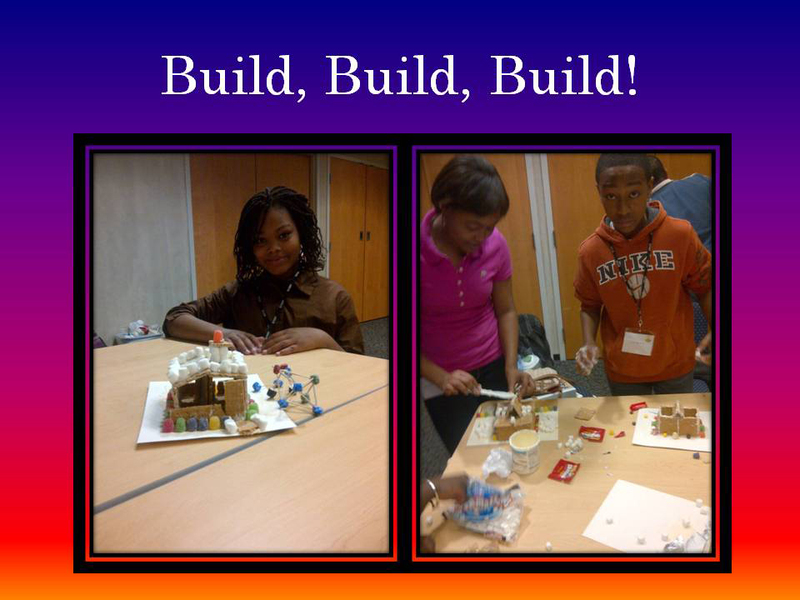 Here the importance of working together to build a structure was highlighted along with the many careers in Civil Engineering. The last workshop was a blast... literally. The students held a Balloon Rocket Competition. 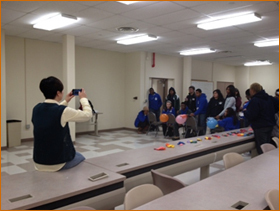 The students learned about the mechanics of tail fins which helped propel the balloon rockets to the finish line. This was a great example of what Mechanical and Aeronautical engineers are involved in. Overall, the students really got a chance to see what engineers do. Although, there were many other engineering disciplines discussed, the students received a clear picture of what is possible in the world of engineering. One of the many bonuses of the day was the College students that volunteered. They shared their "stories" of what inspired them to be an engineer and give great advice on what to do to get into engineering school! This was priceless! 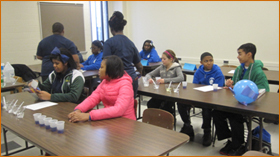 On February 17, 2013 the S.T.E.P Program traveled to the Greater Cleveland Aquarium. The tour allowed students to learn the history of our region's great lakes, including the famous, 1969, burning on the river. Students learned about the different habitats that occupy the great lakes, including fish, such as the shovel nose sturgeon that left when our lakes were polluted and has since returned, since the lake is once again clean, due to regional efforts. Students enjoyed learning about the habitat in each of the thirty (35) plus tanks of all sizes approximately 1,000,000 gallons of water. Some of the creatures in the aquarium that student's learned about includes: jelly fish, turtles, sharks, sea horses and clown fish. Through the student's scavenger hunt and plethora of information provided by the knowledgeable tour guides, it is safe to say that the aquarium's goal of educating students in an entertaining and imaginative way about Freshwater and Saltwater aquatic environments and how our actions affect it, were met. All of the students now know the importance and what part we play to ensure that we work together to keep our great lakes great! 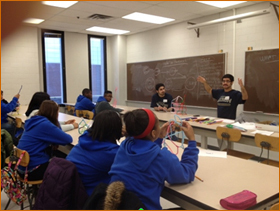 On January 19, 2013 the students of the S.T.E.P program traveled to Tri-C western campus. There, students learned about careers and educational opportunities in the field of: nursing, physician assistant, diagnostic medical sonography and radiography. Additionally, students met with a representative from the admissions department and received a plethora of tips to ensure their future college success such as: financial aid, proper courses to take in high school and what to expect in college. The tour allowed students the opportunity to see what life is like for a college student. Students learned what an ultrasound was and how it operates. Students had an opportunity to learn about the importance of critical thinking in the field of a Physician Assistant. Students took advantage of the hands on activity, using tools similar to that which is used during actual surgical procedures. Students learned what an X-Ray was, where it came from and why people use them. During the tour of the human patient simulator lab, students saw how the human patient simulators are used so that EMT, nursing and other medical students are able to learn what to do during various real life scenarios i.e. : if a patient experiences a seizure. During the journal writing assignment, students expressed how they enjoyed the college visit and hope to visit the campus again. Students indicated that the tour was beneficial and educational in regarding the many medical career opportunities available at CCC. If you've ever thought that science and the holidays couldn't be combined, think again. 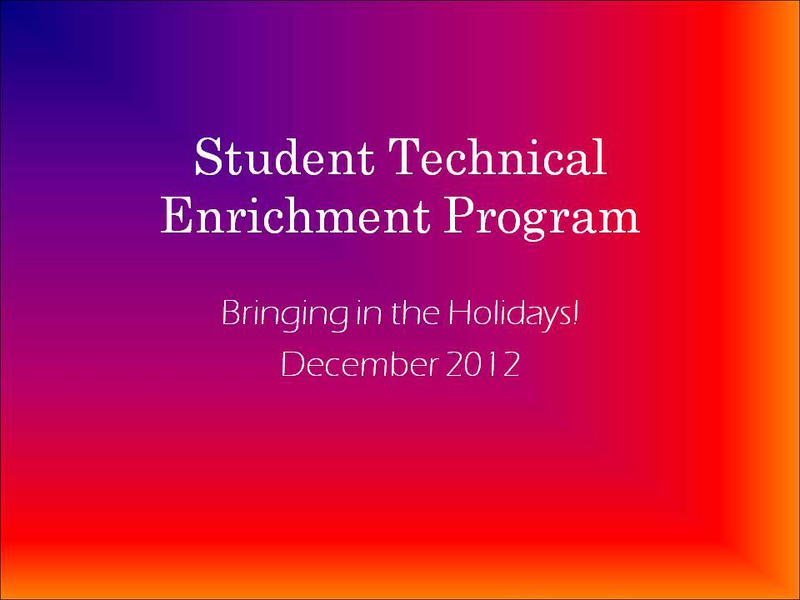 On Saturday December 15th, the Student Technical Enrichment Program (STEP) brought holiday cheer to its students with a day full of holiday activities. Breaking the ice with a good old fashion game of bingo, using holiday spirited words of course, students were able to not only create their own bingo boards, but saw their first chance to win some nice prizes. 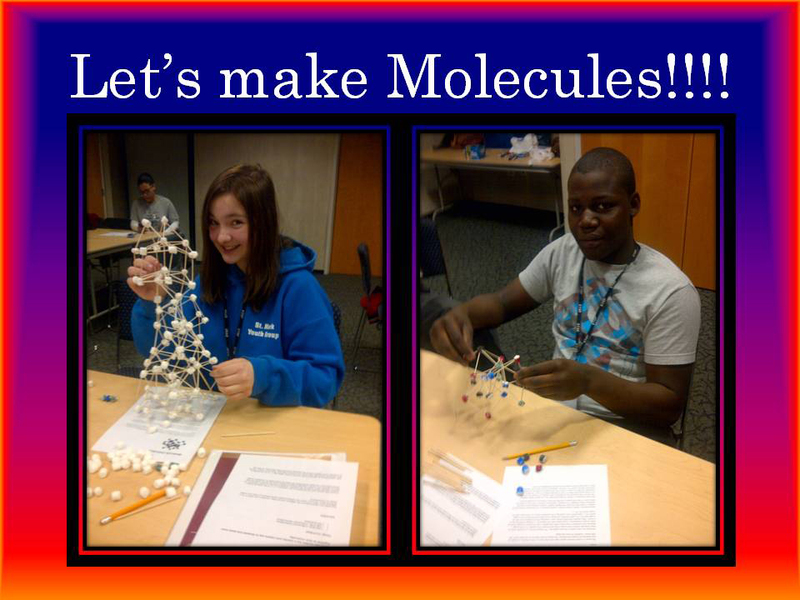 After some fun interaction, students were off to learn about molecules. Using marshmallows, toothpicks and sharpies, students put their engineering skills to work having been challenged to build their own molecular models. 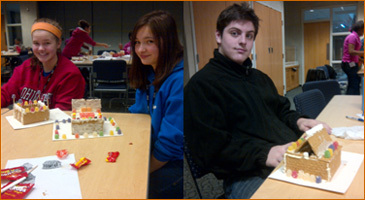 As the day wrapped up, it came time for the famous gingerbread house making, a STEP tradition. Using graham crackers, marshmallows, gum drops and starburst, it was time for the students to get creative. Seeing as though supplies were limited, students were forced to put on those thinking caps and make the houses brilliant. While many houses prospered, some fell to the demise of hungry bellies. After a fulfilling lunch, students were sent off with one last special gift from the STEP staff. 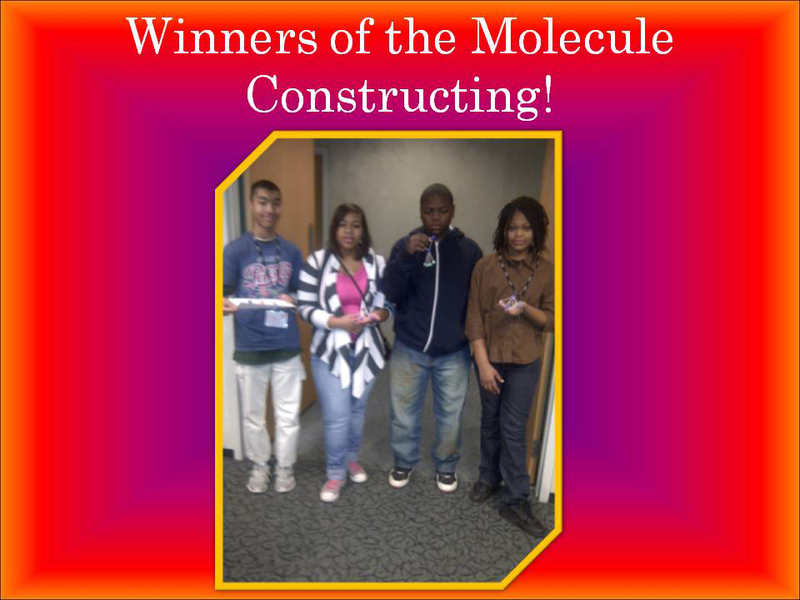 Molecule Winners pictured from left to right: 9th grader Jordan Davis (calcium hydroxide), 9th grader E'Special Williams (ammonium), 7th grader Anthony Scott (sulfuric acid) and 7th grader Antionyse Jackson-Ray (sulfuric acid). 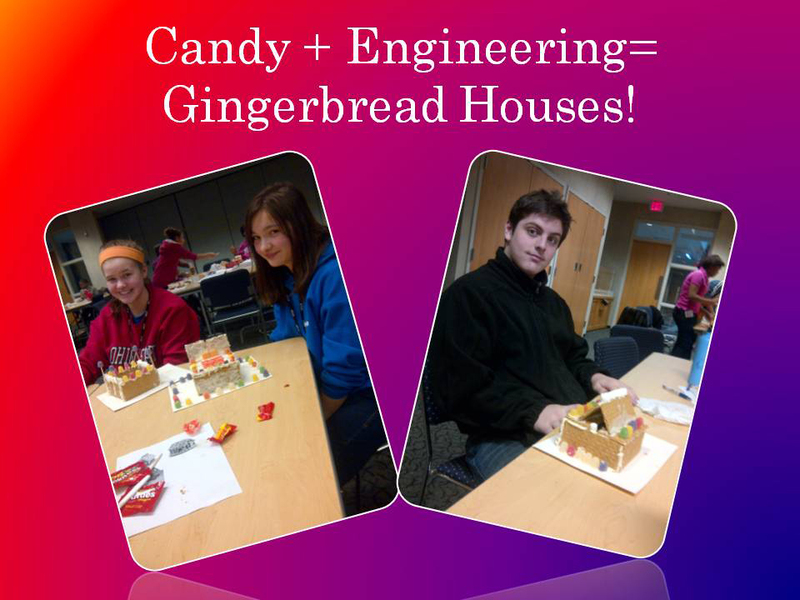 The three 8th grade gingerbread house making winners shown above are: Rachel Miller, Abigail McKenna, and Richard Monastra. 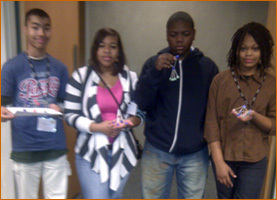 On November 17, 2012 the students of the S.T.E.P program went to the Freeway Lanes Bowling Alley in Solon. Going bowling is a lot of fun but the hard work behind the scenes is what makes it all happen. First the pins don't just set up in a line on accident. The machine that sets up the pins is called the Pinsetter Machine. The pin setter puts them in to the perfect row that allows you to bowl strikes. Gottfried Schmidt is who invented the automatic pinsetter. Before that pinsetter were usually teenagers looking to a fun and easy job. The bowling ball hits the rubber mat and is fed onto a track called a ball wheel, which carries the ball toward the ball return. Inside, long motorized rubber belts carry the ball from beside the pin deck all the way back to where the bowlers are positioned. There is also an oiling machine that the bowling alleys use to keep the lanes slick. In the process of oiling the lanes, the machine picks up any oil left and replaces it with a new layer oil so there is an even distribution. All of these machines are made by mechanical engineers. This shows the role that engineers have in our life for us just to have fun!